A robot named Monirobo has been dispatched to the Fukushima Nuclear Power Station this week to monitor areas of the site that have become so saturated with radiation humans dare not venture there. Monirobo (monitor robot) was developed by the Nuclear Safety Technology Center at Japan's Ministry of Education. The robot has some heft to it, measuring 32 inches long by 52 inches high, and weighing in at approximately 1,300-lbs. A mechanical arm can be extended from the front while a number of sensors bristle about the frame. There are red and yellow versions, each with a specific purpose. 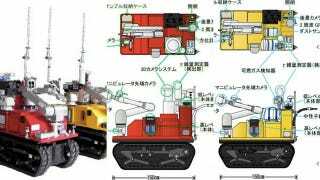 Red Monirobo has already been deployed and Yellow Monirobo—which is more specialized and comes equipped with excavation tools and sensors for flammable gas. Both are heavily shielded against radiation, as it can play havoc with the robots' sensitive onboard electronics.